The four-day culinary festival features more than 75 restaurants. 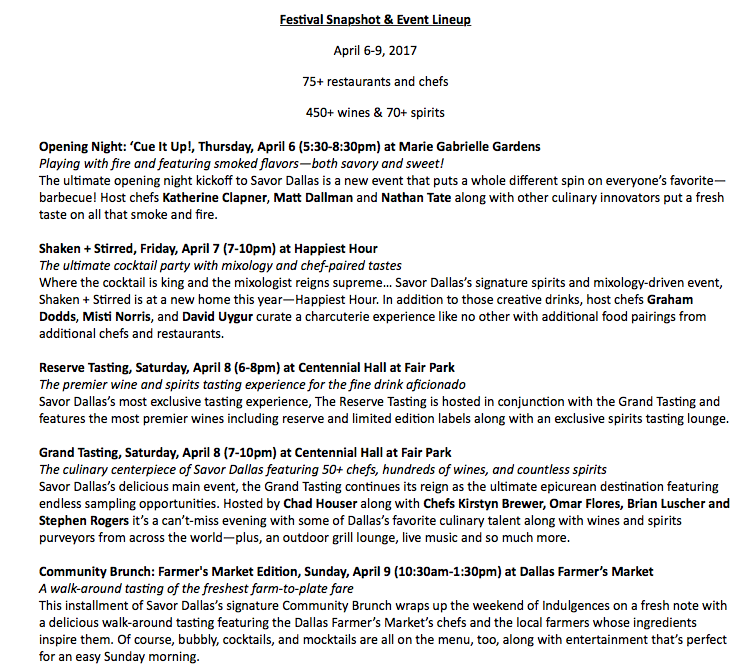 “This year, Savor Dallas introduces a team of host chefs, who will preside over the events and curate one-of-a-kind tasting experiences for guests. The 2017 host chefs include Chef Kirstyn Brewer of soon-to-be-named Chinese concept, Chef Katherine Clapner of Dude, Sweet Chocolate, Pitmaster Matt Dallman of 18th & Vine, Chef Graham Dodds of Wayward Sons, Chef Omar Flores of Casa Rubia and Whistle Britches, Chef Brian Luscher of The Grape, Chef Misti Norris, Chef Stephen Rogers of Gemma and soon-to-open Sachet, Chef Nathan Tate of Rapscallion and Boulevardier, and Chef David Uygur of Lucia. Tickets cost between $55 and $400 and can be purchased here.